Seven Samurai is known to students of movie-making for its introduction or popularization of a variety if filming techniques, particularly for the use of visual imagery to represent one aspect of the story without resorting to words. It is known to critics as a masterpiece of renowned filmmaker Akira Kurosawa. Finally, it is known to fans of film as one of the greatest samurai films of all time – perhaps the greatest. 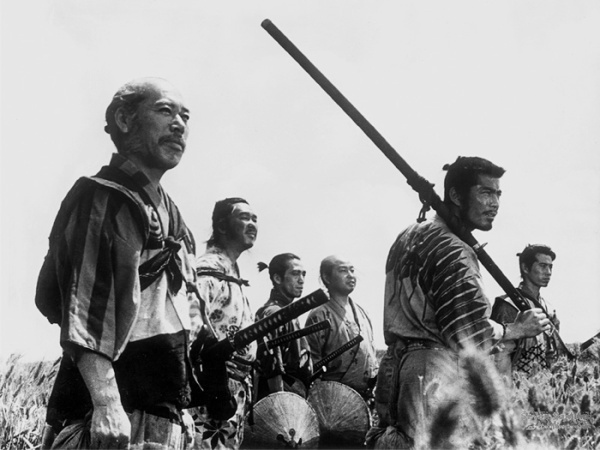 From a cultural perspective, Seven Samurai is not only a contribution to Japanese (and global) culture in and of itself; its trappings are thoroughly Japanese, set in historical Japan (the Sengoku Jidai, or Warring States Period), but its narrative is steeped in the American western. It is a tale of good, evil, and a great deal of gray. The introduction to the film’s plot lays out good and evil. On the “evil” side are a band of ronin under a nameless leader that have joined together to plunder villages of their harvests, inflicting yet another hardship upon the village at the heart of the movie. The good people, as they are viewed by Kurosawa himself and by the movie plot, are beset by taxes, forced labor, and now bandits that threaten to destroy them – for that is the price of resistance, and these people naturally want to resist being pillaged. The Warring States Period saw many villages rebel as part of the Ikko Ikki (一向一揆) movement. The words essentially mean fully fledged insurrection. As a result of the period’s great political and military instability, numerous villages were permitted a wide amount of autonomy so long as they paid their taxes (in rice). And so it is here: a village that acts as a group. It is not so much a democracy as a small tribe, with an elder acting as a chief, but nonetheless, decisions are by the village, for the village. The peasants mourn their lot and discuss appealing to the magistrate for help, but the whole point of autonomy was so that villages would pay their taxes and stay out of the hair of magistrates who are occupied with bigger problems. Furthermore, in such a difficult time, sending men to defend every village assaulted by bandits would be spreading precious armed men thin. The villagers predict the magistrate will be deaf to their cries for good reason. So, their elder tells them they will hire samurai. But what samurai? All that they had was rice for a temporary job. No money. Granted, official retainers were all paid in rice anyway – but money was rising in importance very rapidly, so risking your life for some dinky little village seemed not a good idea without a monetary reward. Or, failing that, so much rice that it could be used for currency – and the villagers didn’t have that level to use here. Certainly not in this time of crisis. So their elder tells them to go find hungry samurai. The search itself is quite a captivating part of the film. Being peasants, they don’t have a clue what is good in a samurai, but they happen upon the film’s chief protagonist, Kambei, cutting off his samurai top knot without hesitation and having his head shaved and his clothing altered to that of a monk. Kambei, a serious Zen practitioner, passes as a monk very well, and uses his guise to trick his way into a hut to rescue a child held hostage by a thief. This act of selfless charity defines the character, who is a wise veteran “of many losing battles,” so he claims, who eschews all ideas of glory, but who takes pity upon the village when it is pointed out to him that he is being served rice by those who would deny themselves rice and eat coarser millet instead, all for the forlorn hope that someone, anyone, would save their village. And so, forming a debt of honor, Kambei raises his bowl to the peasants in thanks, and tells them that this rice will not go to waste. The vast majority of the samurai presented in this part of the film are haughty, vain, prideful, and scornful of weakness, poverty, and unwanted charity. These are not who Kurosawa considers to be heroes whatsoever, and indeed they were not; they were samurai, and that is not the same thing. Yet out of the samurai passing through the well traveled town where the peasants had gone to search, an unlikely band of seven are formed, led by Kambei himself, who will Fight Bandits For Food, but the food is just a convenient excuse. Really, it is to fight to protect the Good People from the Bad Ronin, because that is right and just, and because when push really comes to shove, it’s a more pure cause than fighting for flag, the dollar coin, or a retainer fee. Katsushiro is a young samurai, handsome and well dressed, untested by real battle but eager to learn from a courageous and mature master like Kambei. This puts Kambei in a difficult position initially, but Kambei knows a minimum of seven will be needed, and Katsushiro’s sincerity will be a virtue. Gorohei is an archer of some skill who becomes the second in command of the group. He assists with planning and strategy. What impresses him is Kambei’s character, for while the peasants certainly arouse some sympathy from him, it is that a man of Kambei’s wisdom and stature is willing to go this far to help them that inspires him to assist. Shichirojo is an old friend and subordinate of Kambei’s who survived one of Kambei’s losing battles, if quite narrowly. Meeting Kambei by chance, he resumes his former role, even though his former commander tells him in all truth, this could be the fight that does them in. But loyalty takes him far, and if you are going to die, you might as well do it beside the people you choose. Heihachi is introduced to us viewers as a samurai willing to chop wood for food. Gorohei calls his bluff about being better at chopping men… but Heihachi is certainly a samurai who will work for food. He also has a lighthearted and sensible attitude, not wanting to die nobly if there is no necessity to do so. Kyuzo is a man of great fencing skill who easily earns Kambei’s full respect and admiration as a man devoted to nothing higher than the absolute perfection of his craft. Initially declining Kambei’s offer to join the group, he changes his mind, for if one is truly devoted to mastering his craft, the banner one fights under matters not; it is the battle itself. Or put simply, with someone like Kambei giving it a serious go, why not? Finally, Kikuchiyo, played by the great Toshiro Mifune. is essentially a SINO – Samurai In Name Only. He has a forged pedigree to “prove” it, too. Bearing an over-sized sword (to compensate for the fact he’s not a samurai), Kambei sees right through him. Nonetheless, he pushes his way into the group, searching for acceptance from real samurai. Kikuchiyo is a window into this world for us, the viewing audience. He is at once a buffoon, but also a tough and hardy man whose courage under fire proves second to none. It is important to note that during much of this period, samurai hailed from any background; it is only late in the period that all class mobility was rendered illegal, and enforcing this thoroughly required a more stable country that did not yet exist. At any rate, Kikuchiyo may not be a samurai by blood; if he was not born samurai, he certainly died samurai. A reader wishing to pick up on cultural issues may want to re-read these bios and understand that each character represents an aspect of what Kurosawa believed to be heroic, with the fact they are samurai (or Samurai In Name Only) as a detail, an issue of culture and history but not character and worth as a human being. Kambei and others look at Kikuchiyo like he is wearing human hides cut from dead fellow samurai. Finally, out of a mixture of disgust and understanding that the buffoonish Kikuchiyo simply didn’t know, they explain to him that there is only one way the villagers could have such armor: by murdering traveling samurai. This does not, however, undermine the perceived goodness of the Good People of the village whatsoever. Their cowardice, their fearfulness, and yes, even their disdain of samurai and the murdering of traveling samurai in the past, these are all absorbed by a filter of understanding and sympathy for their plight: they are weak people, banding together in a group for survival, and they are doing whatever that survival seems to require. Acting in the director’s stead, Kikuchiyo explains precisely these facts to the offended samurai. In another scene, Kikuchiyo rings the alarm to fake a bandit attack, berating the samurai-hating villagers for running straight to the samurai for salvation. It is through his intervention that both sides come to understand that in a gray world, different people either work together, or all is reduced to ash. Stand together or be divided – with a sword. When the daughter of one of the main villager characters falls for Katsushiro, it is the villagers, not the samurai, who are the truly outraged ones, but Kambei puts down their anger by saying that in any castle on the eve of a big battle, this is what happens. Love is part of human nature. Applaud rather than sneer. This, a very modern message, was not exactly a common message in Japanese films! But, Kurosawa put it in anyway. Finally, when the battle is won, four samurai are dead, the villagers sing as they plant their crops, the brief romance is long forgotten, and the surviving samurai leave, reflecting that this was not a winning battle, either. It is the villagers that won, not the samurai. What is left unsaid is two things. This is the only way it could end from the start. This is the only way it should end, for heroes do not fight for their own glory. They fight for the Good People. The battles that I am glossing over were very well done and very gripping. It’s something like a horror film, except with a lack of cheap tricks like cramped places and flickering electric lighting. Both attackers and defenders suffer setbacks leading up to a climactic final battle, one where the entertainment factor is high indeed. Those unaccustomed to the period may find the presence of firearms surprising. Although not exactly common in general, the big victors of the era got that way through the skillful adoption of gunpowder weapons from Western contacts and a budding domestic manufacturing industry. This was long forgotten – or made irrelevant – by the time of the Meiji Restoration, where samurai continually renounced the use of firearms to engage the enemy by sword alone, going to their deaths. In this sense, Seven Samurai presents a much more “real” sense of the era, in microcosm, than modern era popular culture would give credit for. Even though it is not Kambei’s group that uses guns, their use, while some may feel is quite cowardly (an impression not exactly discouraged here), was not historically impossible in the slightest. Rare, yes. Unheard of? Not at all. Ultimately, Seven Samurai is revered because before being anything else, it is simply a great film, with great acting, great directing, and a great story. Samurai make a great attraction, but the setting is simply the stage: the story is the human heroism at work, heroism that goes unrewarded without any legacy except the survival of the village. But the village belongs to the villagers, not the samurai. The samurai are as if foreigners in their own country, a transient, temporary group of warriors who, for many different reasons and in many different ways, fought and died in the innumerable, nameless battles of the era, and not just the ones chronicled in the history books. That is actually the best description of the samurai that I can possibly give you. The advantage of watching the film is that no one has to tell you. You can just see and experience it for yourself. This entry was posted in Art, Culture, Japan, Movies and tagged Akira Kurosawa, art, culture, film, Japan, Seven Samurai, 七人の侍. Bookmark the permalink.